Mary Annette Pember/YouTube Justice Murray Sinclair, chairman of the Truth and Reconciliation Commission, presents the panel's final report on residential schools, calling them "cultural genocide." It was a long time coming, but the words that residential school survivors and their loved ones had long awaited were finally uttered. “Canada clearly participated in a period of cultural genocide,” said Justice Murray Sinclair, Ojibwe, who chaired the Truth and Reconciliation Commission (TRC) and presented its official findings about Canada’s residential schools program on June 2. 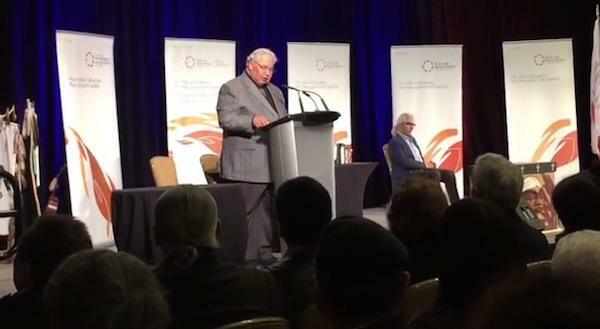 The packed Delta Ottawa hotel ballroom audience erupted into cheers and applause as people rose to their feet when TRC Chairman Justice Murray Sinclair, Ojibway, presented the panel’s findings. “It has come full circle,” noted Eugene Cardinal of the Cree Nation. Cardinal’s tone betrayed a tinge of irony. An Indian residential school survivor, he observed that the final gathering of the TRC, convened as one component of Canada’s Indian Residential Schools Settlement Agreement, was taking place in Ottawa, the very place where the original policies intended to ‘kill the Indian to save the man’ had been created more than 100 years ago. The crowd of mostly aboriginal people heartily approved the TRC’s summary version of a multi-volume report. Six years in the making, the report documents widespread physical and sexual abuses at government- and church-run residential schools from 1883 until 1998. Emotion ran high in the audience, swinging from shouts of jubilation to cries of anguish as some broke down in tears when Sinclair described the organization’s work. Much of the healing came from simply allowing the survivors to speak about what had happened to them. Report findings tied trauma from residential school abuses with generational problems plaguing indigenous people today such as addiction, poverty, suicide, high rates of incarceration and health disparities. “We heard of the impact of over 100 years of mistreatment. We heard from families and loved ones connected to survivors for whom the effects had been deeply damaging and still felt today,” Sinclair said. Sinclair spoke of the legacy of residential schools that left indigenous children culturally, emotionally, physically and spiritually adrift. He described Canada’s efforts to extinguish indigenous culture, language and peoples as the very essence of colonialism. Even today these issues persist, and among 94 recommendations for changes contained in the report were improvements in government child welfare practices that continue to separate indigenous children from their families. The report also recommends incorporating indigenous history and residential school experience into school curricula; funding health care programs to address health disparities between Indigenous Peoples and the mainstream population; adopting the United Nations Declaration on the Rights of Indigenous Peoples into law, and developing a royal process of reconciliation issued by the Crown. The latter, according to Sinclair, should include a repudiation of the Doctrine of Discovery that gave 15th-century European explorers the right to lay claim to lands they discovered. He also noted that the recommendations include a call for a national inquiry into missing indigenous women and girls. Sinclair maintained that the current Canadian government has yet to make good on its claims that it wishes to join with aboriginal people in a relationship based on shared history and respect for one another and a desire to move forward together as promised nine years ago in the prime minister’s apology. During a press conference following the presentation of the report, one reporter asked if the Commission might have been overly ambitious in requesting such a long list of recommendations. “We made the recommendations to guide activities for the future, not just for this government,” Sinclair replied. All three commissioners met privately with Prime Minister Harper later in the day. Harper would not commit to any of the TRC’s list of 94 recommendations,CBC Newsreported. “Canada is one of the very few countries in the world where aboriginal and treaty rights are recognized, and that’s one of the reasons why the government accepts the UN declaration as an aspirational document,” Harper said after Opposition Leader Tim Mulcair asked why the government would not incorporate the U.N. Declaration on the Rights of Indigenous Peoples into law. A bill to do so, introduced by Cree Member of Parliament Romeo Saganash, failed earlier this month in the House of Commons. “I believed Prime Minister Harper when he issued the apology in 2008 but I’m not sure the government bureaucrats understood what the words meant,” Sinclair said of the 2008 apology offered by Harper. Indeed, there was a whiff of cynicism under the crowd’s shouted praise for all that the Residential Settlement Agreement entailed. “During the presentations, I heard a woman describing the government and church leader’s promises and apologies as lies,” noted Cree Nation member Isabel Otter, a residential school survivor. Survivors interviewed by ICTMN mostly focused on the opportunity for personal growth and healing that the Settlement and TRC activities provided rather than the promise of government changes. She worried, however, about those who have not yet come forward and wondered if they will have the support they need in the future. Two sisters from the Lac Seul Band of Ojibway shrugged their shoulders in response to questions about what the future holds for government promises to improve indigenous relations. Her sister bemoaned the continued legacy of racism among her fellow white Anglican Church members. Both sisters agreed that whether the government will make good on any of its promises remains to be seen. Survivors also spoke of forgiveness and the healing it provided. Commissioner Chief Wilton Littlechild, also a survivor, spoke emotionally about the power of spirituality, resilience and forgiveness.